In margin transactions, an investor trades stocks after (1) depositing a certain amount of collateral (margin requirements) with securities companies and (2) borrowing funds for purchasing stock or stocks for sale. Margin transactions help investors to expand their trading volumes by enabling them to purchase stock of which the value is in excess of their available funds, or to sell stock which they do not own. Thus, margin transactions broaden and strengthen stock trading and contribute to the smooth circulation of stocks and the fair stock prices formation. Margin transactions are used, for example, when an investor considers that the stock price of a certain issue will rise or decline in a short period of time. When it is expected that the stock price will rise, an investor borrows funds from securities companies for purchasing the stock (margin buying), and if the stock price rises as expected within a term of repayment (6 months), the investor sells the stock, repays the funds borrowed (reverse transaction) and receives the margin. The investor may also receive the stocks (actual receipt) by procuring funds separately and depositing it with the securities companies. Conversely, when it is expected that the stock price will decline, an investor borrows stocks from securities companies and sells them (margin selling). If the stock price declines as expected within the term of repayment (6 months), the investor buys back the stock, returns it to securities companies and receives the margin. The investor may also receive the equivalent money to the price of the stocks sold by procuring stocks separately and offering them to the securities companies (actual delivery). In addition to the purpose of obtaining margins as described above, an investor can use margin transactions as a means for hedging. In other words, in the event that, although an investor expects that the stock price in hand may decline, the stock is not to be sold for some reasons, such as that convertible bond is within its convertible period or that it is a publicly-offered stock just purchased, the investor can avoid loss with hedging sale by using margin transactions. There are two types of margin transactions, standardized margin transactions and negotiable margin transactions. In standardized margin transactions, treatment of Premium Charge among buy/sell side investors or terms of repayment, etc. are determined by stock exchanges and are applied uniformly to all transactions. And securities companies can borrow funds for purchasing and stocks for sale needed to settle standardized margin transactions from a securities finance company (Loans for Margin Transactions (LMT)). In negotiable margin transactions, the conditions of margin transactions may be decided freely in negotiation between securities companies and its customer. However, securities companies cannot use Loans for Margin Transactions" for settlement of negotiable margin transactions. What are Loans for Margin Transactions? 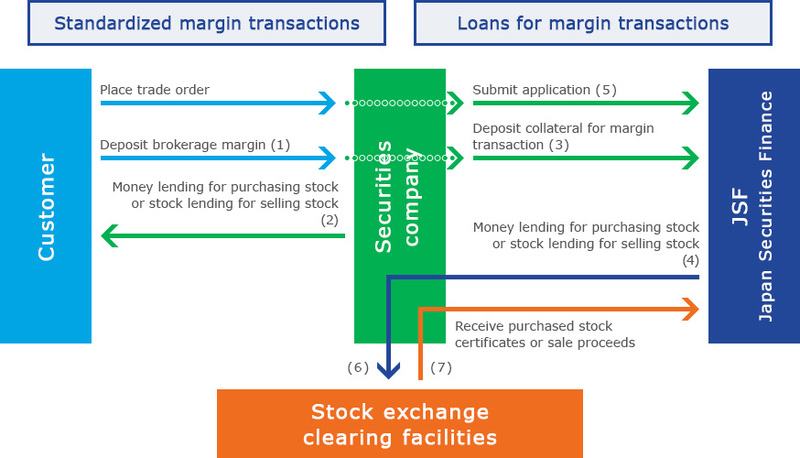 Loans for Margin Transactions are a financing scheme in which a securities finance company receives a certain amount of collateral (margin requirements) from securities companies, which are general trading participants of a stock exchange (3) and lends funds or stocks necessary for the settlement of margin transactions (4). This financing is executed through the clearing facilities of the stock exchange. Only securities finance companies with a license issued by the Prime Minister can conduct Loans for Margin Transactions. Japan Securities Finance Co., Ltd. (JSF) conducts Loans for Margin Transactions through the stock exchange in Tokyo, Nagoya, Sapporo, and Fukuoka. JSF receives loan applications for each eligible issue from securities companies on the trading date of standardized margin transactions(5). To execute the loan, JSF, in place of the securities companies, delivers funds or stocks to clearing facilities of stock exchange(6). The stocks purchased (Collateral Stock for Money Lending) or proceeds from the sale (Collateral Money for Stock Lending) are received and kept by JSF as the collateral of the loan (7).